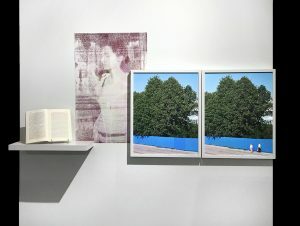 Three artists were selected from the 10 Finalists to receive solo exhibitions in spring/summer 2018 at The Print Center, Philadelphia. Daniel W. Coburn’s exhibition featured previously unshown works from the series Becoming a Specter. The black and white photographs draw on Coburn’s ongoing interest in the imagery of family photo albums. These works seek to complicate our understanding of the idealized American Dream typically depicted in those collections. Daniel W. Coburn was born in San Bernardino, CA. He holds a BFA in Art from Washburn University, Topeka, KS and an MFA in Photography from the University of New Mexico, Albuquerque. His photographs have been the subject of solo exhibitions at Filter Photo Space, Chicago; La Fototeca Gallery, Guatemala City, Guatemala; Silver Eye Center for Photography, Pittsburgh; and Mulvane Art Museum, Topeka. His work is held in several public collections including the University of New Mexico Art Museum; Museum of Contemporary Photography, Columbia College, Chicago; and Marianna Kistler Beach Museum of Art, Manhattan, KS. His first monograph, The Hereditary Estate, was published by Kehrer Verlag in 2015. Coburn is a recipient of a 2017 John Simon Guggenheim Memorial Fellowship. 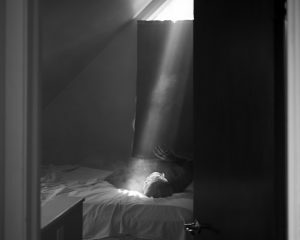 He currently serves as Assistant Professor of Photo Media at the University of Kansas, Lawrence. 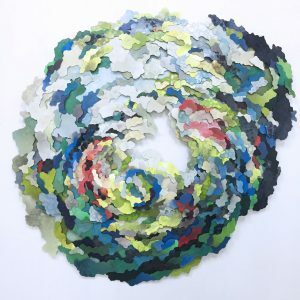 Julie Anne Greenberg created installations composed of hundreds of printed and cut paper components affixed directly to the wall. Based on weather maps of hurricanes and tropical storms, her work explores the ways that we quantify and personify these natural events. Julie Anne Greenberg is originally from New Jersey and currently lives and works in Raleigh, NC. She holds a BFA in Sculpture from Tyler School of Art, Temple University, Philadelphia and an MFA in Printmaking from The Ohio State University, Columbus. She is currently an Assistant Professor of Art at Wake Technical Community College, Raleigh. Greenberg exhibits locally and nationally, and her work is included in both public and private collections. Her works have most recently been exhibited at The Mint Museum, Charlotte; SCOPE Miami Beach; University of Utah, Salt Lake City; and University of North Carolina, Wilmington. Jacob Koestler combined multiple print and photographic media, sometimes in the same piece. His work invites the viewer to consider similarities between the ways we perceive the visible world and the ways in which photographs operate. Koestler’s work illuminates both the possibilities and the shortcomings of the printed image. Jacob Koestler is an artist and musician from Johnstown, PA. He holds a BS in Photography from The Art Institute of Pittsburgh and an MFA from the Photography and Integrated Media program at Ohio University, Athens. His practice includes photography, video and multimedia installation. Koestler composes live scores for his videos under the name Rural Carrier, and is a co-founder of My Idea of Fun, an art and music archive that features over 350 releases, including his own albums and photography books. Koestler's artwork has been exhibited and published throughout the United States and internationally. He currently lives and works in Cleveland, OH, where he is a lecturer in the Photography and Video Department at The Cleveland Institute of Art.